Created by the passage of the Federal Reserve Act in 1913, the Federal Reserve System serves as the central bank of the United States. Commonly known as the Fed, it conducts monetary policy for the nation by exerting direct influence on the money supply, interest rates, and the purchase of government securities. It is the means by which federally issued currency and coinage reaches financial institutions, which receive these through the 12 Federal Reserve district banks located in various major cities throughout the United States. The Fed also sets the interest rate at which it loans money to member financial institutions, thus establishing a baseline for the rates of interest at which money is borrowed and lent throughout the United States. The initial mandate granted to the Federal Reserve System by Congress was to provide and ensure stability, safety, and flexibility in the national monetary and financial system. Since 1913, the responsibilities and powers accorded to the Fed have grown considerably. Today the Federal Reserve shapes, directs, and conducts U.S. monetary policy. Its overall concern is the well being of the national economy, which it seeks to achieve through a number of measurable goals, including price stability and full employment. These goals it achieves, in turn, through three principal means at its disposal: the control of the money supply by the issuance of currency to member financial institutions, the setting of interest rates at which it loans funds to those institutions, and the open market purchase of government securities. Controlling the money supply. Under the Legal Tender Act of 1862, the United States began issuing currency notes, known as U.S. notes, through the Treasury Department, and continued to do so until January 21, 1971. At the time it passed the act, Congress set a limit of $300 million on the value of U.S. notes that could be in circulation at any one time. Significant by the standards of the Civil War era, this sum represents a tiny portion of the funds in circulation today, which are known as Federal Reserve notes. Whereas U.S. notes represented obligations of the federal government alone, Federal Reserve notes, authorized under the 1913 act that created the Fed itself, represent an obligation both of the federal government and the Federal Reserve system. The original Legal Tender Act was accordingly amended to include Federal Reserve notes as legal tender, meaning that they legally satisfy debts equal to the face value of the note tendered. It is technically illegal to refuse legal tender (which today is synonymous with Federal Reserve notes) for services already rendered, though it is not illegal to refuse it for services not yet rendered. Therefore, a business that accepts only checks or credit must post a notice indicating this, so that the customer is aware of the fact prior to tendering payment. Setting interest rates. In addition to controlling the money supply through the issuance of legal tender, the Federal Reserve directly affects monetary policy by a second and perhaps even more significant means: the setting of interest rates. This is accomplished by determining the discount rate, or the rate it charges member institutions for loans. These institutions, in turn, charge other depository institutions a certain rate for overnight loans of funds that are immediately available at the Federal Reserve Bank. The rate at which Fed member banks charge money to depository institutions, known as the federal funds rate, will always be slightly higher than the discount rate, but varies from institution to institution, and from day to day. 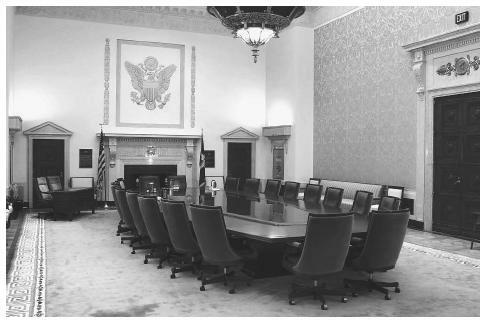 Guided by tradition, Federal Reserve Chairman Alan Greenspan assembles members of the Federal Open Market Committee around this 27-foot magohany table eight times a year to set interest rates. businesses and individuals—slightly higher rates. By this chain of relationships, the Fed exerts an all but direct influence on consumer credit costs ranging from the annual percentage rate on a credit card to the rate charged on a 30-year housing loan. Open market operations. In addition to setting interest rates and controlling the money supply, the Fed conducts monetary policy through a third instrument, open market operations, or the buying and selling on the open market of securities issued by the U.S. Treasury and federal agencies. These securities include bonds of various types, as well as other government certificates. In each case, the value of the bond or certificate ultimately rests in the fiscal strength of the federal government. Historically, the Federal Reserve has tied its objectives for open market operations either to a certain quantity of reserves, or a certain price. Prior to the administration of Federal Reserve Chairman Alan Greenspan, who was appointed by President Ronald Reagan in 1987, the Fed tended to focus on seeking a desired quantity of securities as reserves. Since that time, however, the Fed has sought to attain desirable levels in the price of securities, which are the federal funds rate. From 1995, it began announcing target levels for the federal funds rate, which rose in the healthy economic climate of 1999 and 2000, but fell in the recessionary economies of 2001 and 2002. The open market operations of the Federal Reserve System are a clear means by which the Fed helps to maintain both financial and ultimately, political stability in the nation. Although it continually pursues its objective of ensuring stability through the three significant means at its disposal, the actions of the Federal Reserve become particularly evident during periods of financial upheaval. The stock market crash of October, 1987, the Asian financial crisis and its aftermath in late 1998, and the terrorist attacks of September, 2001 each presented an occasion in which the U.S. financial system faced challenges, and when consumer faith in the national economy wavered. In each such situation, as well as in less significant crises, the Federal Reserve has gone into action, ensuring monetary liquidity through large balances of available cash; keeping interest rates manageable by extending discount loans to depository institutions; and setting the example of faith in U.S. institutions by purchasing government securities on the open market. Even in times when the affairs of the nation are running more smoothly, the Fed continues to influence monetary policy. Americans are less likely to take note of the Federal Reserve in those situations, yet it is the Fed itself that deserves much of the credit for the stability in such times. The most visible means by which the Fed affects the economy is through the discount rate, which serves, in effect, like a gas pedal for economic growth. When rates are low, economic activity increases, and the economy grows. If the economy grows too fast, the Fed may raise interest rates as a means of ensuring price stability and protecting against inflation. The chairman of the Federal Reserve leads a seven-member Board of Governors, all of whom are appointed by U.S. presidents. The president also appoints the chairman and vice-chairman from among the board members, appointments that must be confirmed by the U.S. Senate. Alongside the board is another entity that arguably exerts as much power, the Federal Open Market Committee (FOMC), which oversees open market operations. The FOMC sets the objective for open market operations, meaning that it sets the federal funds rate. If the Fed purchases securities, thus adding to reserves, then depository institutions will tend to take on new loans and investments, which has the effect of lowering interest rates. Of the seats on the FOMC, seven are filled by the members of the Board of Governors, and an eighth by the president of the New York Federal Reserve Bank. The other four are divided among the 11 other Federal Reserve banks, which fall into four groups (Boston, Philadelphia, and Richmond; Chicago and Cleveland; Atlanta, St. Louis, and Dallas; Minneapolis, Kansas City, and San Francisco), with presidents from each city in a group serving rotating one-year terms. Banks. Although there are only 12 Federal Reserve banks, each has branches in other cities. For example, the Federal Reserve Bank of San Francisco has branches in Los Angeles, Portland, Seattle, and Salt Lake City. The 12 district banks release currency, and every banknote issued in the United States bears the seal of one of the district banks to the left of the portrait on the observe side. Federal Reserve banks sell stock to member institutions, which include national and state-chartered banks, as well as trust companies. All national banks, which are chartered by the Office of the Comptroller of the Currency in the Treasury Department, automatically belong to the Fed, while state banks and trust companies have to meet requirements set by the Board of Governors. All members are required to purchase from their regional Federal Reserve banks stock equal to six percent of their capital, of which half is paid in, while the other half can be called in by the Board of Governors. Relationship with the federal government. The Federal Reserve System is a part of the government in the sense that it was created by Congress, and is subject to congressional oversight. Furthermore, its leadership is appointed by presidents, although board members' 14-year terms extend far beyond the term of the chief executive who appointed them. Unlike most bureaus of the federal government, however, the Fed is independent of any cabinet-level department. Its decisions do not require the approval of the president, Congress, or any other member or body of the executive or legislative branches. Nor does it depend on funding appropriated by Congress. Almost alone among government institutions, the Fed actually pays for itself through the interest it receives on its holdings of federal securities, and through the fees it charges depository institutions for such services as processing and clearing checks. As a non-profit institution, it turns its net earnings over to the Treasury each year. These earnings are far from inconsiderable: in 2001, the Federal Reserve paid $27.14 billion to the federal government. Greider, William. Secrets of the Temple: How the Federal Reserve Runs the Country. New York: Simon and Schuster, 1987. Mayer, Martin. The Fed: The Inside Story of How the World's Most Powerful Financial Institution Drives the Market. New York: Free Press, 2001. Woodward, Bob. Maestro: Greenspan's Fed and the American Boom. New York: Simon and Schuster, 2000. Federal Reserve Board. < http://www.federalreserve.gov/ > (February 5, 2003).